The goal of the Soft Robotics Toolkit is to provide useful shared resources in order to help advance the field. 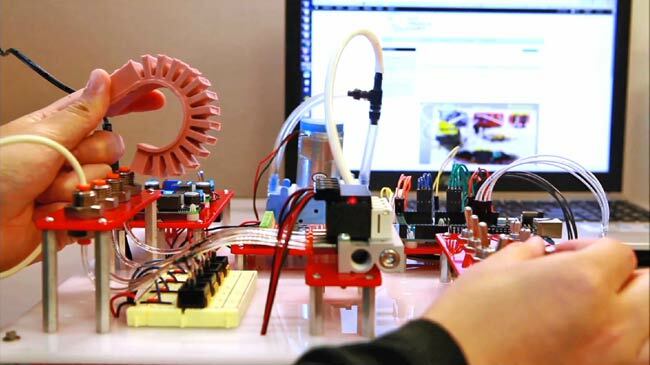 Furthermore, the Soft Robotics Toolkit aims to provide a platform for soft robotics enthusiasts around the globe to connect and share ideas. To this end, we are proud to announce the launch of the Soft Robotics Toolkit Forum. Please make use of this resource to start interesting discussions around soft robotics, or to ask questions about the content of this website. The Soft Robotics Toolkit team is pleased to announce a new collaboration with UTEC's MaB Lab in Lima, Peru. As part of this exchange, we are welcoming Marielena Velasco, from UTEC, as a research intern this spring. Ms. Velasco will be investigating novel manufacturing methods of molds used for soft robotics fabrication. Currently, the default method for mold fabrication is 3D printing. Although the use of 3D printing is rapidly spreading, this technology is still expensive and not yet readily available to all soft robotics enthusiasts. Ms. Velasco's project will address this issue by developing cheaper molding techniques out of readily available materials. The manufacturing methods developed throughout this internship will be tested and implemented during a 5-day design workshop in Lima, Peru this summer. This project is supported by the Harvard-UTEC Faculty Grants Program.